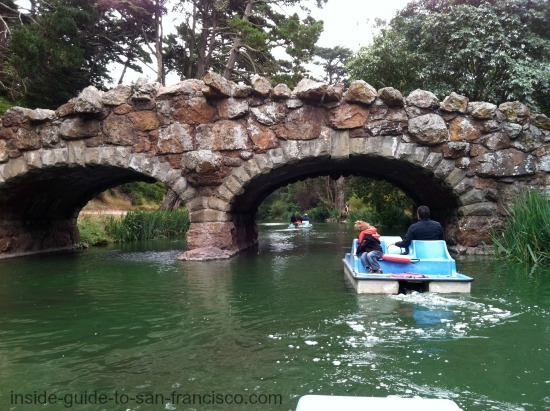 Visit Stow Lake in Golden Gate Park. 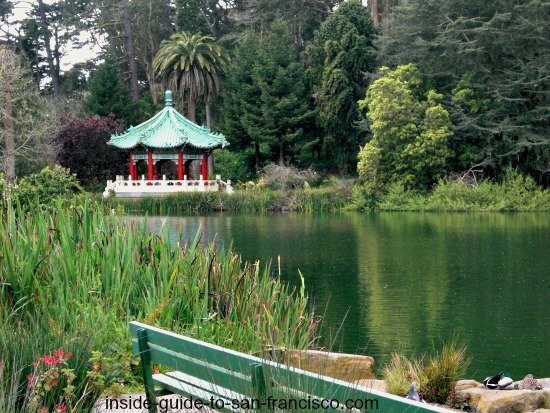 Stow Lake is a man-made lake with an island in the middle, tucked away in Golden Gate Park. 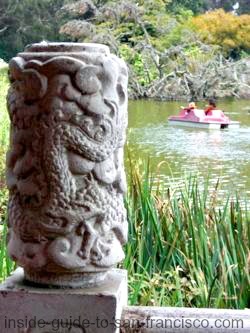 This charming little lake, with its pedal boats, waterfall and Chinese pavilion, is one of the locals' favorite places. 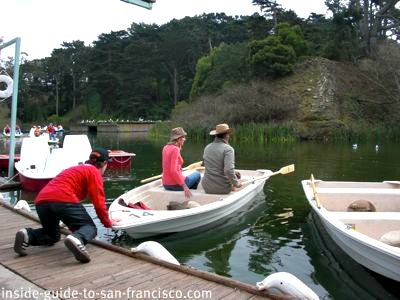 Generations of San Franciscans have been coming to Stow Lake to sail around on the boats, walk the wooded paths and watch the ducks and turtles. You can rent boats, and stop for a bite to eat at the snack bar/cafe. There's plenty of parking and it's easy to get to by bus (see maps below). 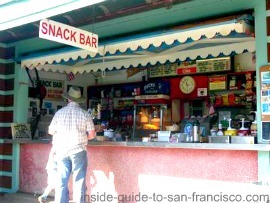 Snack bar: open daily, 11 am to 5 pm. 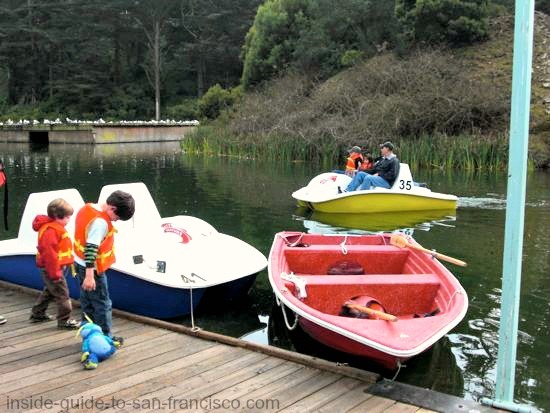 Boat rentals: daily, 10 am to 6 pm. There's a bit of something here for everyone, for all ages and levels of activity. The boathouse is the center for boat rentals. Last boat rentals 1 hour before closing. Life jackets are provided and required. 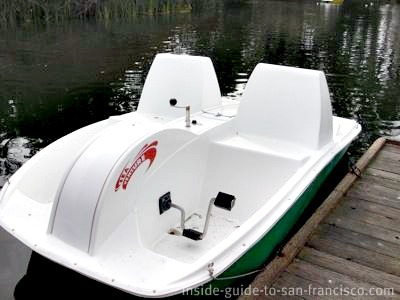 Rowboat or pedal boat? Both are popular ways of getting out on the water and exploring the lake. 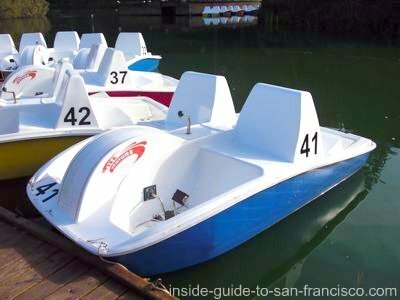 Pedal boats: These pedal-powered boats come in two sizes: 4-person and 4-6 person. The new ones have a stick for steering, instead of the steering wheel like the old boats. 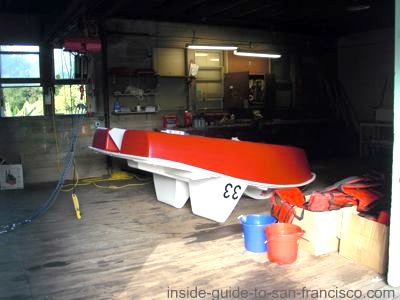 Electric boats: the electric boats are gone again. They seem to come and go. What to see on the lake. 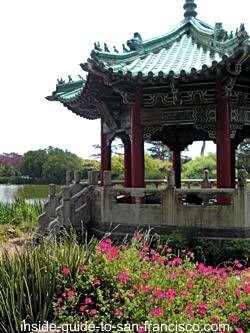 Sail under the old stone bridge, past the waterfall and the colorful Chinese pavilion. You can make a full circle around the island if you're feeling energetic. You'll probably be joined by ducks and seagulls hoping for a snack. A leisurely trip around the lake takes about an hour, or a little less, so the timing is just right for an hour's rental. If you bring it back a little later, they won't charge you for the extra hour. The bike rental (different company) has moved. 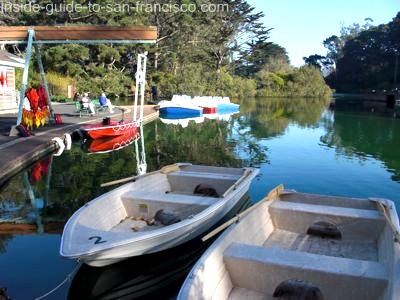 It's no longer possible to rent bikes and surreys at the Stow Lake boathouse, but the good news is that they are still available. You can rent them over by the de Young Museum nearby. Parkwide rents bicycles, tandem bikes for two, and surreys for two or four, daily from 8:30 am to 6 pm. Behind the bandshell at the Music Concourse, in the park near the Tea Garden and de Young Museum). 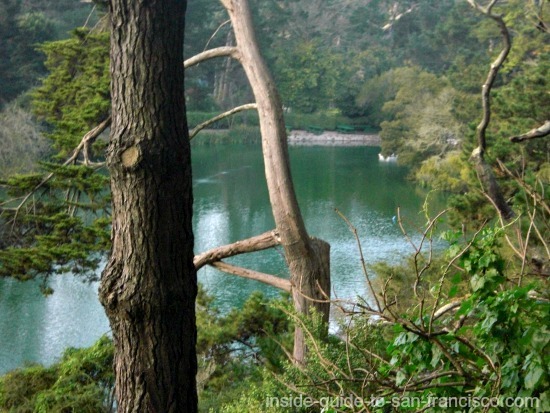 Golden Gate Park has miles of roads and shady paths for bike-riding. Want to travel as a group? Try the surrey (2-4 people). 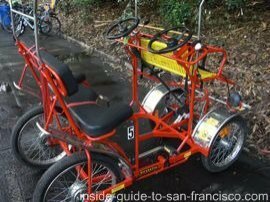 There are now four companies that rent bikes in Golden Gate Park, two of them fairly close to Stow Lake. 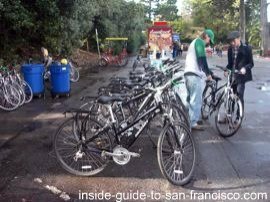 To see a map of where all the rental locations are, and a comparison of their prices and services, see park bike rentals. Circle around the lake (about twenty minutes) or cross over one of the two bridges and follow the path around the island. 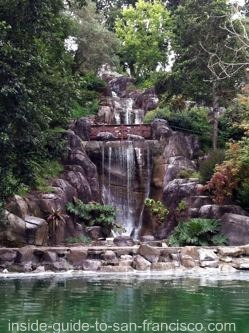 The island route takes you past the Chinese Pavilion and the waterfall. 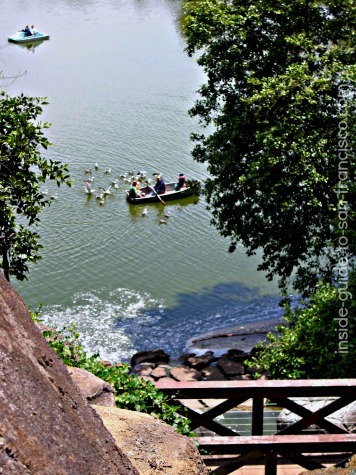 Climb the stairs alongside the waterfall, or take the path, to the top of Strawberry Hill for pretty views. 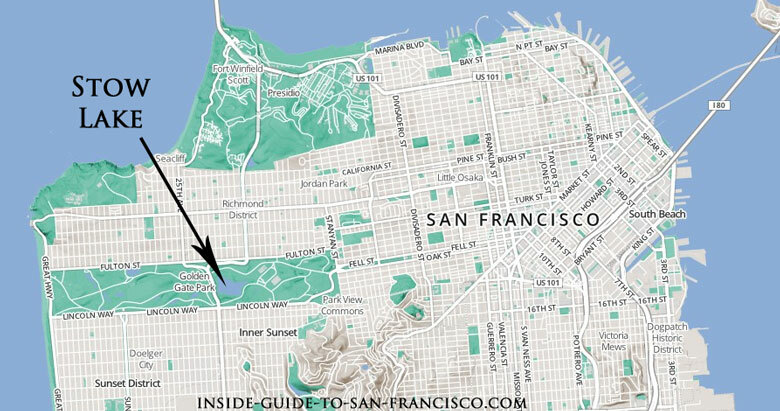 You can catch a glimpse of the Golden Gate Bridge and the Transamerica pyramid from there. Officially, you're not supposed to feed the ducks and geese - it's really not good for them, but you would never guess that by all the feeding activity. Mallards and Canada geese live or winter at Stow Lake and there's always a row of turtles basking on a log. And anywhere there's a food handout, you'll have seagulls. Guard your hotdogs. Babies in springtime! 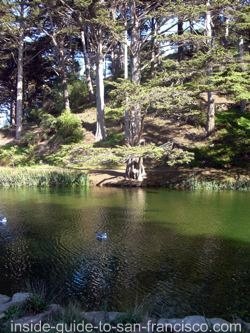 Young birds hatch in the spring at Stow Lake. 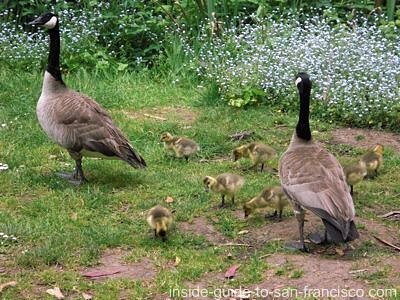 This time of year, you'll see strings of ducklings and goslings toddling after their parents. We are really lucky to have Great Blue Herons nesting at the lake every year as well. The four foot tall herons arrive in January to start building their nests (and pick out their partners). They sit on their eggs in March, then the chicks are born in April. For a glimpse of the parents feeding the young ones, come to the shore by the boathouse, where you can see the small island directly in front where the Great Blues nest every spring. The chicks are in the nest during April, May and June. During April and May, the Heron Watch Program naturalists will be there with their spotting telescopes; the public is invited to take a look. The birds are big enough to see even without the scopes, but if you have binocs, bring them for a close-up. 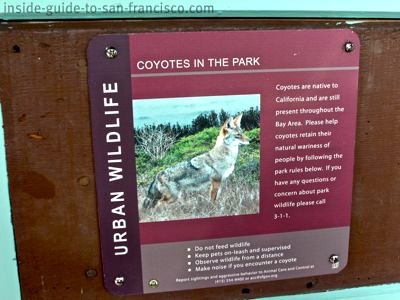 Yes, we have coyotes in Golden Gate Park now. 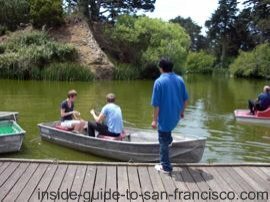 But you're not likely to see them at Stow Lake, at least not in the daytime. Ditto for the raccoons and possums that live in the park. 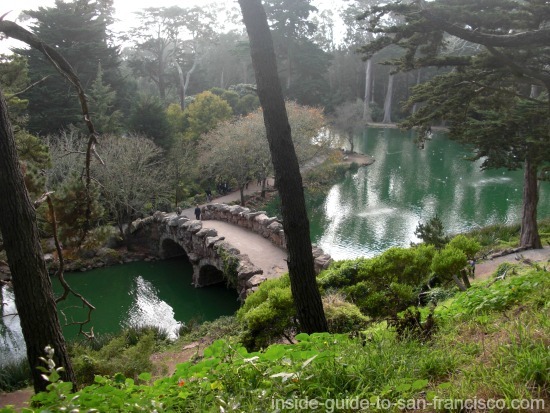 Stow Lake is roughly in the middle of Golden Gate Park, on the east side of 19th Avenue. The lake is just east of where 19th Avenue (Cross Over Drive) cuts through the park. You can get to the lake from either of the two roads that run lengthwise through the park: JFK Drive or Martin Luther King Jr Drive. Watch for a wooden sign across the road from the turn-off; it's easy to miss. Park anywhere around the lake (see parking tips below). 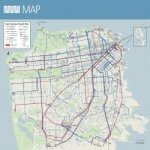 The #5 Fulton Bus goes from Market Street, between 7th and 8th Aves (Civic Center Bart) along Fulton Street, which runs along the north side of Golden Gate Park. Get off at Fulton and Park Presidio. Or take the #71 Bus from Market Street at Gough St, and get off at 19th Ave on the southern side of the park. It really helps to have a map for walking around in the park; it's huge and the roads are confusing. Nothing is direct; I'm familiar with it and still I get lost sometimes. Where to park? 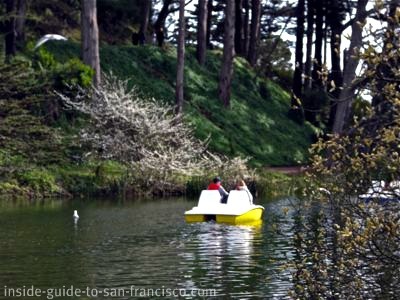 Stow Lake is one of the easiest places to park in San Francisco. The parking lot at the boathouse is small, but you can park anywhere on the road that rings the lake. The best spots are just before you reach the boathouse, approaching from the Martin Luther King Drive side. It's one-way around the lake. 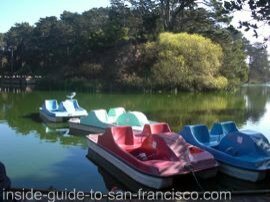 Find out all the things to do and see in Golden Gate Park: museums, lakes, windmills, bike rentals, and more. 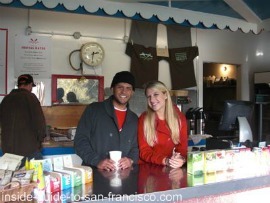 A new company has taken over management of the boathouse concession. 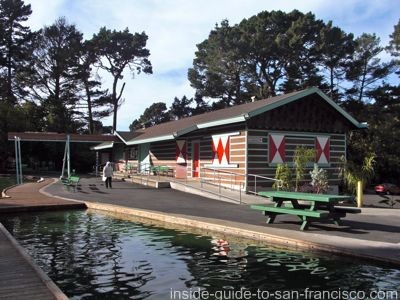 In a move that stirred a great deal of passion locally, the management of the historic Stow Lake boathouse was transferred from a family that had run the boathouse concession since 1949, to an out-of-state company. 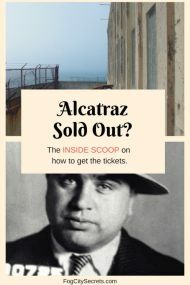 Many people were outraged by the plan, and this became a hot political and legal battle. The boathouse was closed for a couple of months, but now the new boats are in operation and the cafe has opened. The boathouse looks basically the same after the changeover; the paint has been freshened and disabled access and railings added. The same senior folks are occupying the benches in front. 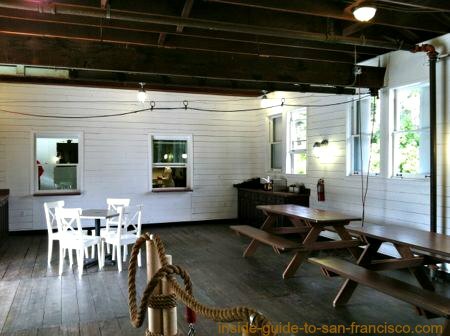 The boat storage room became a small eating area with tables and chairs. 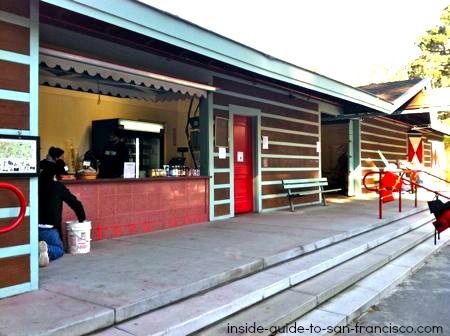 People had been very concerned that the beloved, old-fashioned snack bar was going to be torn down and transformed into a characterless, yuppie cafe, like so many others, but that hasn't happened. Fortunately, the old boathouse remains intact. An indoor seating area is now available. Locals have been coming here since the 1950's; they had fond childhood memories of this place, and brought their children - and now their grandchildren - to get hot dogs and ice cream at this boathouse. 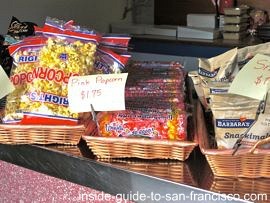 Fortunately, cherished goodies like the pink popcorn, hot dogs and "It's It" ice cream are still available. I was pleased to see the new cafe matches the rustic look of the boathouse. You can order food at the concession counter, then take it to the tables inside if you like. On weekends and summer holidays there are lots of people out here enjoying the lake. A pleasant way to spend the afternoon; the lake is so big, it doesn't feel crowded. 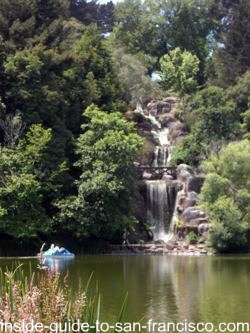 There are stairs next to the man-made waterfall; they'll take you to the top of Strawberry Hill, on the island in the middle of Stow Lake. 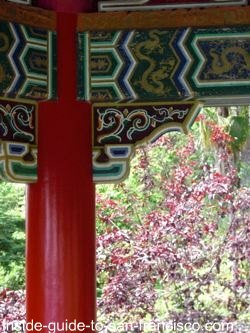 Be sure to explore the Chinese Pavilion; the carvings are beautifully decorated and it's a peaceful place to sit. There are two foot-bridges to get over to the island.